Boker Knives, Limited Non-Catalog "Off the Wall" knives typically have carbon steel blades, unusual handle colors, brass liners and nickel silver bolsters. 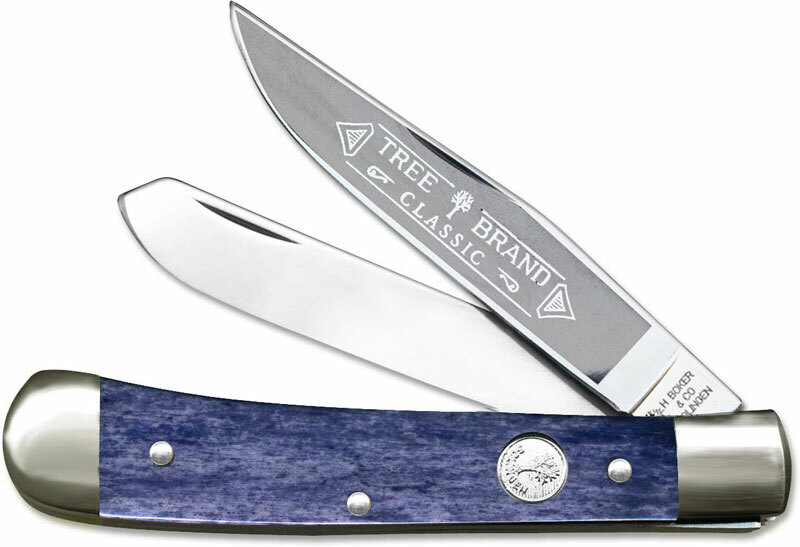 This 112525SBLB Boker Trapper - a classic traditional two blade pocket knife, features clip and spey blades made of Solingen carbon steel with nail nicks for opening. The eye catching Smooth Motley Blue Bone handle, 4 1/4 inches closed, has unusual mottled streaks and patches, brass liners, nickel silver Tree shield and nickel silver bolsters. Made in Germany; limited quantities. Editor's note: Most smooth bone handles will have visible pores that resemble holes or cracks-expect this. Pores are not a defect; they are characteristic of the natural handle material. Looks like Boker used a Cobalt blue dye. This bone has a purple stonewashed look to it. Not much blue at all. Boker Tree Trappers are the best for a production quality knife .